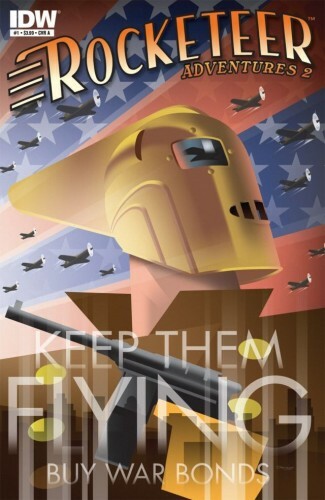 IDW Publishing did two volumes of The Rocketeer Adventures, an anthology comic featuring new stories of Dave Stevens' character by a diverse range of writers and artists. The first issue of the second volume contains the story "A Dream of Flying" by Stan Sakai. Flying through a rural area, the Rocketeer is attacked by a young man with red hair wielding a shotgun. After Cliff falls through the roof of a barn, the redhead demands his rocket pack, saying he’ll disassemble it to see how it works and build a better one. Cliff’s enemy is attacked from behind by a young boy with a spit curl in his black hair, and Cliff delivers a knockout blow to the would-be thief. The boy says of the thief, "Pa always said that Lex is a bad apple." He expresses excitement at Cliff’s ability to fly, and says he has always dreamed of doing so himself, but it’s impossible. Cliff takes off into the air with the ecstatic boy in his arms, then brings him back to the ground and flies off into the distance. The boy’s parents arrive home from shopping to find him with a sheet tied around his neck, proclaiming he flew. When his mother comments on the boy’s imagination, his father says, "Now, Martha, a bit of imagination is good for a boy his age.” The boy plays happily, saying “Up, up, and away!" as his dog follows him. The boy is clearly a young Clark Kent, and this takes place before he discovers his superpowers. However, the CU version of Clark was already a grown man and active as Superman by the time Cliff Secord became the Rocketeer, thus placing this story in an AU.